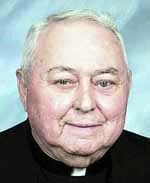 Father Philip R. Barr, pastor emeritus of St. Edmond Parish in Philadelphia, died Nov. 27. Born in Philadelphia, the son of the late Philip R. and the late Marie (Chobert) Barr, he attended St. Rose of Lima School, St. Callistus School and West Catholic High School. Although he received an appointment to the United States Naval Academy, he opted instead for the priesthood and entered St. Charles Borromeo Seminary. He was ordained May 22, 1948 by Bishop J. Carroll McCormick at the Cathedral of SS. Peter and Paul and his first assignment was in hospital chaplaincy at the former All Saints Chapel, Philadelphia. In those early years he also assisted Father John Kavanaugh in the establishment of Chinese ministry at Holy Redeemer Chapel. Other assignments included Our Lady of Grace, Penndel; Holy Saviour, Linwood; St. Patrick, Norristown; St. Eugene, Primos; Our Lady of Fatima, Secane; St. James, Elkins Park; St. Philip Neri, Lafayette Hill; St. James, Philadelphia and St. Clement, Philadelphia. Although her husband is also deceased, “they are together in heaven, I’m sure,” she said. In 1979 Father Barr was appointed pastor of St. Edmond and he really found a home there until his 1995 retirement. After his retirement Father Barr helped out at various churches and whenever possible he would go to Malvern Retreat House to hear confessions on Saturdays. Bishop Michael J. Fitzgerald celebrated Father Barr’s funeral Mass at St. Edmond and the homilist and concelebrant was Father Joseph J. Kelley, pastor of St. Monica Parish with which St. Edmond’s – now a worship site – merged earlier this year. Other concelebrants of Father Barr’s funeral Mass included Msgrs. William J.J. O’Donnell and Daniel J. Sullivan; Father Francis J. Cornely and many priest friends. Father Barr is survived by his brothers, D. Robert Barr and F. Donald Barr, and many nieces and nephews.